Atief, Scott, and I got to know one another a few years ago when we were competing on a prediction market as part of the Good Judgment Project forecasting tournament. We each ended the season among the top 2% of forecasters, which qualified us as superforecasters. We’ve all continued to forecast with Good Judgment, Inc. (which—disclaimer—is not responsible for the content of our podcasts in any way). In our first podcast, we explain why we think National Front leader Marine Le Pen will lose in the second round of France’s présidentielle. Scott and I argue that Donald Trump may have just a 5% of winning in November. I also call Trump’s campaign a “Trumpster fire”. In our inaugural “Swan Hunting” segment, Atief suggests a possible black swan event that could occur after the U.S. election. In our second podcast, we revise Trump’s chances upward as the polls tighten. Scott and I talk about why we didn’t think the UK was likely vote to leave the EU. We consider whether certain questions are difficult or inappropriate for us to forecast and I suggest a possible black swan event the Middle East. In our third podcast, we continue to increase our estimate of Trump’s chances, but disagree with Dilbert creator Scott Adams’ view that Hillary Clinton’s public illness makes her “unelectable”. We look at a couple unusual forecasting questions and consider a possible black swan event on the Korean Peninsula. Atief also tries to stop swearing. We hope you enjoy our conversation. If you disagree with us—or just have questions you would like us to discuss in future episodes—let me know in the comments or e-mail us (nonprophets [at] nonprophetspod.com). If you’re interested in reading about what makes a good forecaster, I highly recommend Superforecasting: The Art and Science of Prediction and Thinking, Fast and Slow. Links to books I recommend, review, or cite are Amazon Affiliate links. I receive a small percentage of any purchases made through these links. 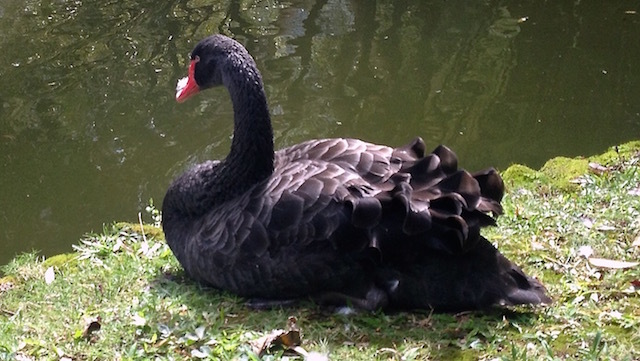 Black swan at the Byodo-In Temple in Kane‘ohe, Hawaii courtesy of Robert de Neufville. This entry was posted in Forecasting and tagged atief heermance, black swan, brexit, dilbert, donald trump, forecasting, hillary clinton, marine le pen, non-prophets, north korea, podcast, saudi arabia, scott adams, scott eastman. Bookmark the permalink.